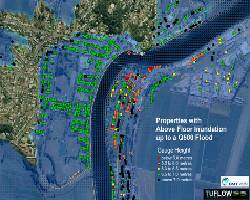 To better prepare residents and emergency services of an impending flood, BMT WBM, a subsidiary of BMT Group, the leading international maritime design, engineering and risk management consultancy has further enhanced its flood modelling software, TUFLOW. This follows the recent floods in Brisbane where affected residents are still trying to pick up the pieces after this devastating event. Now featuring a gauge output function, TUFLOW will give warning times and gauge levels for specific properties in the affected area. This powerful feature will provide Councils with practical information on what a gauge height flood warning means to their residents and most importantly, what action may need to be taken. Bill Syme, Flood Engineering Expert at BMT WBM comments: "It is standard practice for flood warnings to be based on forecast levels at river gauges, information which is issued by the Bureau of Meteorology. However, for local communities and businesses, this doesn't really provide them with a clear understanding of what action they need to take. TUFLOW allows a link between gauge height warnings and residential and business properties to be made. In turn, this provides people with a clearer idea of how much time they have, whether they need to move possessions to a higher level or remove them completely, if they need to gather sandbags or if they need to do anything at all." Although natural disasters such as the Brisbane floods cannot be avoided, being better prepared through predictive systems such as TUFLOW can provide the necessary reassurance and guidance residents so desperately want at such a difficult and traumatic time.